Michigan streams are some of the most diverse streams in the country. 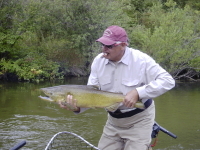 From the introduction of Brown trout to North America (Michigan streams being the first), to the planting of Steelhead and Salmon in the Great Lakes, Michigan offers a fly fisherman’s dream come true. 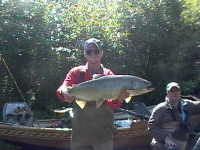 With an abundance of Biomass(Stones, Caddis, Mayflies) and a world famous Hexagenia limbata hatch, it is easy to see why Michigan has so much to offer for fly fisherman.Michigan has over 36,000 miles of rivers and streams to fish, Michigan truly does offer a diverse fishery. 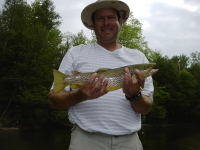 Weather you are fishing the tail waters of the Big Mainstee for Salmon / Steelhead, or fishing for trophy Brown trout on the free stone "Flies Only" section of the Upper Mainstee, Au Sable, or Pere Marquette, Michigan rivers rate the best for fishing diversity. One Of My Favorites for Trout! Listed As A Top 10 IN The World For Smallmouth Fishing! 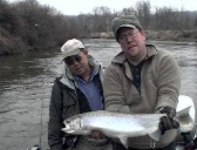 Some Of The Best Steelhead Fishing To Be Found! Great Place For Atlantic Salmon Fishing!